We are located on Route 16, the major road that runs North/South from the top of New Hampshire to the bottom. 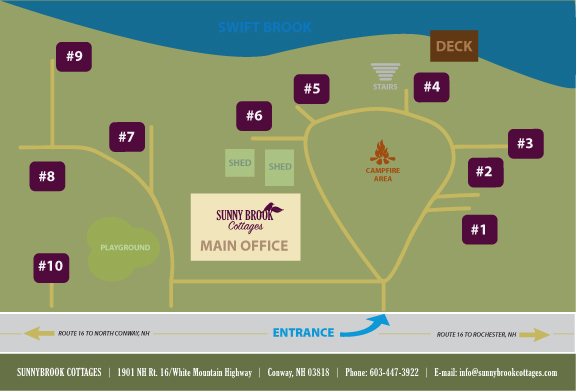 We are just 4 miles south of Conway Village or 3 1/2 miles south of the Kancamagus Highway (Rt. 112). 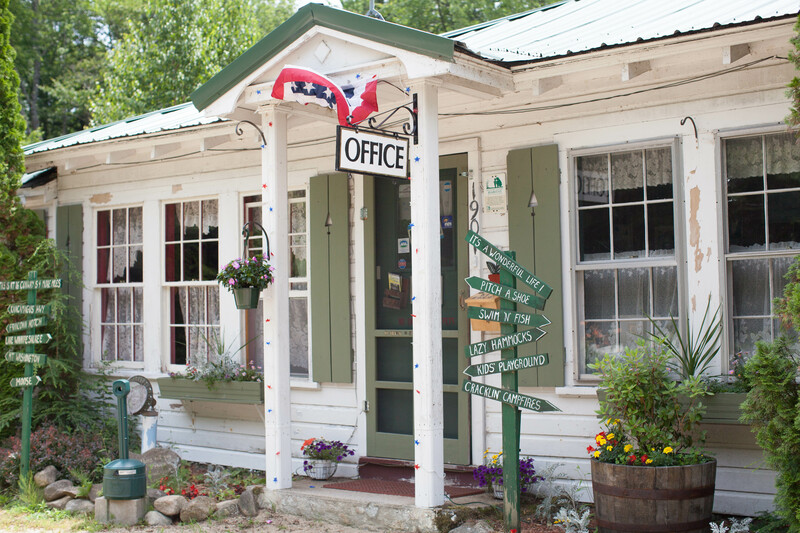 Our office and large sign are easily seen from the road with the cottages scattered through the nearby woods. If you are coming at night, just look for the row of coach lanterns that will be brightly lit along our 500- foot white fence. We are the brightest thing you will have seen for miles! From Massachusetts: Take I-95 North into New Hampshire. Continue on toward Portsmouth, NH. Take Exit 4 (lane breaks to left, look for “White Mountains” signs). If you miss this exit you will be headed toward Maine. This is Route 16 (also known as the Spaulding turnpike). Continue on for approx. 1 hour 15 minutes. Stay on Route 16. 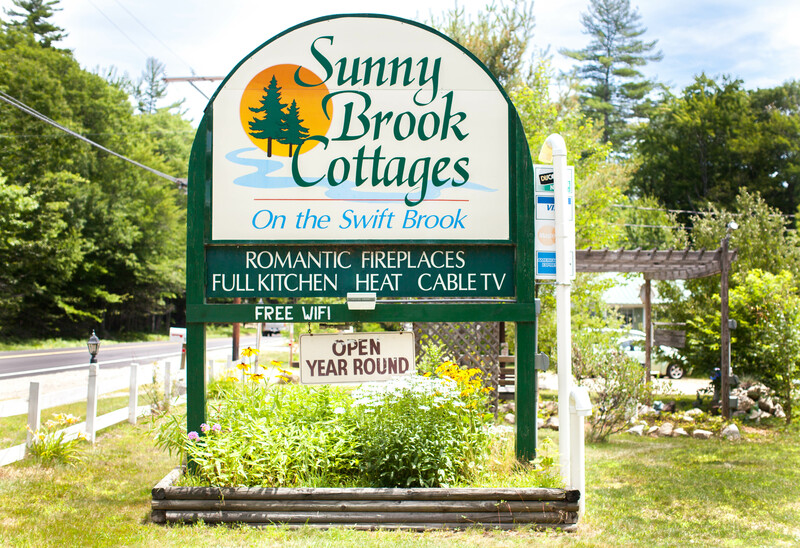 Sunny Brook Cottages is on Route 16 soon after Davie’s Campground Store and the Albany Town Hall. Look for a long white fence and our brightly lit sign on the right side of the road. If you reach the traffic lights of Conway Village you have gone four miles too far. From Maine: Take Route 302 all the way into New Hampshire. Drive straight through all the traffic lights. (You will be on Rt. 113 briefly and then on Rt. 16 in Conway Village). This will keep you heading south through Conway Village. You will pass the turn for the Kancamagus Highway (Rt. 112). We are 3 1/2 miles past that turn, on the left. Watch for our long white fence and coach lanterns. From Manchester/Concord, New Hampshire: Go North on Interstate 93 to Exit 23. Follow Route 104 East to Meredith. Take Route 25 East to the junction of Route 16 in Ossipee. Take 16 North for approximately 15 minutes. We will be on your right just beyond Davie’s Campground Store and the Albany Town Hall. Look for our long white fence, brightly lit coach lanterns, and big sign. From Connecticut: Take Route 84 to Route 90 (The Mass Pike). Go for only one exit to Route 290 North (exit 10). Take 290 (drive through Worcester, Mass) to Route 495. Take 495 to Interstate 95. Go to directions from Massachusetts. From Lower New York: Take the New York thruway (Major Deegan) North to Route 287. Go East to 684 North to Interstate 84 East. Continue to the Mass Pike (Route 90). Go East to Route 290 North (exit 10). Take Interstate 495 to Interstate 95. Go to directions from Massachusetts. From Ottawa/Montreal: Take 417 East to Montreal (turns to 40 just before Montreal). Take Decarie South (15 South) through Montreal over Champlaign Bridge. Take 10 East to Rock Island Exist (55 South). Take 55 South to Rock Island Border Crossing. Go South on 91 until you get to Interstate 93 (Exit 19).Take I-93 south until Exit 40 (for 302 East). Take this exit and head east on Rt. 302 toward Bethlehem. Follow 302 east to North Conway. At the junction of 302/16, continue on Route 16 South through Conway Village. You will pass the turn for the Kancamagus Highway (Rt. 112). We will be on your left, 3 1/2 miles after the Kancamagus Highway . Drive safely! We will see you soon!